We have a lakefront property with a private dock, large deck with a Palapa roof over the lake. The house is a large 3 bedroom, 3 1/2 bathroom modern villa. Magnificent views of the lake and volcanoes. The Palapa over the lake is one of the most unique feature of this property. Ideal for weddings, parties, yoga, or just lounging in the sun. It consists of a 1000 sq ft deck with a palapa roof over half of the deck, providing ample sun and shade. Deck furniture, lounge chairs, hammocks and swings. The house is a grand villa with huge bay windows looking out over the lake from the living room, dining room and bedrooms. There are three very large private bedrooms, each complete with a private bathroom consisting of double vanities, shower and tub. The master bedroom has a king sized bed, while the two guest rooms consisting of 3 beds each (1 King sized, 3 doubles, and 2 can be rearranged to suit your needs). The house also has a full kitchen, gas BBQ grill, patio, dining room, living room, and meditation room. Perfect for groups of couples, families, or individuals. The house can comfortably sleep up to 12 guests. The house has a beautiful yard with palm trees, plenty of outside sitting and hammocks, outside furnished patio with a BBQ gas grill, high speed WiFi Internet access, hot water, and full kitchen with appliances. Our house sits on the main lakefront path that runs from Santa Cruz to Paxanax. There are hotels and restaurants to enjoy within a 10 minute walk from our home. You can also reach any of the other villages around the lake for day trips by boat. The first public boats begin by 6 AM while the last ones return at 5:30 PM. Private boats can be arranged to pick you up or drop you off at our private dock at any time. Enjoy the spectacular views of Lake Atitlán and the volcanoes while relaxing in comfort at Casa de Larry. 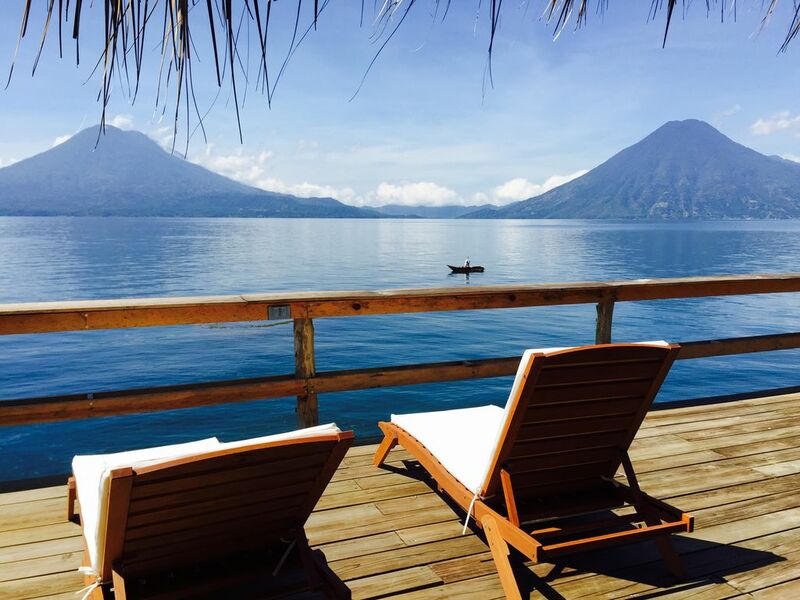 We offer the perfect place for you and your guests to experience the wonders of Lake Atitlán. Guests renting the house will have full use of the entire house, yard, palapa deck, and private dock. We have a small casita behind the house where the onsite care takers live. If needed, we can arrange private transportation from the Airport in Guatemala City to the docks of Panajachel where we can also have a private boat ready to take you to our private dock. About $100 for the private shuttle for 2 people from Guatemala City and $20 for the private boat. My son and daughter-in-law, Larry and Sarah, are live in care takers who live in the casita behind the main house. They will greet you when you arrive and be glad to answer any questions you may have about the property and the surrounding lakeside. The only way to arrive to Santa Cruz is by boat. If you arrive by car you can easily leave it parked in a secure car park in Panajachel called Cayucos Marino for 50Q a night, located right next to the public docks to Santa Cruz. There are plenty of public or private boats that can transport you to Santa Cruz. The rate for a public boat from Pana is Q10 per person or Q20 from San Pedro. A private boat can be negotiated from Q100 to Q150 per trip. I am a small business owner that God has continually blessed and I believe in giving back to others. My company, East Coast Roofing has partnered with Manna Worldwide and we are the sole sponsor of a nutrition center in Solola, "Nido de Aguila or Eagles Nest." I own a home on the beautiful Lake Atitlan and would love for you to come here to relax and embrace the beauty of the "Lake". For me, I enjoy traveling, spending time with my family, and sitting on the Palapa visiting with friends while welcoming new ones. One of the best views in the world. Looking out across Lake Atitlan and seeing the majestic Volcanoes of San Pedro and Toliman. We have a huge private deck and Palapa built over Lake Atitlan. Great for catching the sun, doing some yoga or watching the stars at night. Private dock to come and go from around the lake. Fun living room and sitting/meditation room. Great inside and outside gathering areas, fully furnished. The best coffee in the world, grown, picked and dried locally. Drinking and cooking water and basic cooking essentials provided. Full kitchen and pantry with range of cooking utensils and appliances. See the Game Library picture! Beautiful outside patio and lakeside deck and private dock. The entire town of Santa Cruz is not wheelchair accessible, boat access only. We ask that you smoke outdoors. Beautiful lakefront property with deck and Palapa, great for families, special occasions and parties. We very much enjoyed our stay at Casa de Larry. With it's beautiful views and lakefront location, it's very hard to beat. Larry was very helpful throughout our stay. Lovely location with beautiful outdoor space. Laid back vibe and gorgeous sunsets. Perfect location on Lake Atitlan, close to the village but with private deck on water. Well set up in house, comfortable, and rustic. Perfect host with lots of valuable information. My family of 12 stayed at Larry's house for Christmas for 3 nights and it was the most amazing experience. He welcomed us at his private dock when we arrived from Panajachel and helped us take all of our luggage and things in. The house was very clean and fully equipped! We made christmas dinner there for our entire family and he had enough kitchen supplies for everything. Even had some things in the fridge and said we could use (honey, juice, strawberries). There was also a helper than came in to help us clean up the kitchen, wash dishes, sweep, etc. All twelve of us comfortably fit in the home and there were various communal spaces around the house to enjoy. We really liked that because there was space for the older people to just sit down and talk but also another space with couches where the younger ones could play games without disturbing the rest of the group. (There is also a game closet that we took full advantage of) The house was picture perfect with a private palapa with comfy couches that we sat on to see all of the fireworks from the surrounding towns on christmas eve. We had such an amazing view of the lake from the front door and even the master bedroom. What a beautiful sight to wake up to! We were able to get into the lake right from the private dock too! Overall Larry was an amazing host, and truly gave my entire family a magical christmas that we will never forget. Thank you Larry for sharing your amazing home. We really hope to be back one day. It was a pleasure hosting you and your family over the Christmas holiday. I'm so happy we were able to give you such a wonderful experience. Your family was excellent! We hope to host you again in the future. It is a beautiful spot to enjoy Lake Atitlan! The home itself was lovely, right on the water and the views to dye for. We were without electricity for 2 days, so that made it a bit awkward! If it happens frequently, Larry should think about getting a generator like other rentals around us. There is one thing I might add, the owner is staying in the casita on the property and although he was helpful, you might feel that your privacy is invaded as he likes to sit where I would guess he considers 'common property'. It was not a problem for us but it might be for others. The house was as described and the view was spectacular! Larry Jr and his wife were so hospitable and helpful. They prepared the house for us and stocked the fridge in advance with all our favorites. Ice is not plentiful and Larry was kind enough to have the freezer well stocked!!!! They offered the best recommendations and were extremely knowledgeable about Lake Atitlan and Guatemala in general. Their recommendation of Xocomil Tours helped us throughout our stay because Frederico and Andreas went above and beyond! Highly recommend this villa!!! Our home is in Santa Cruz la Laguna on Lake Atitlan. You can only access Santa Cruz by boat from any of the bigger towns across the lake such as Panajachel or San Pedro. Public and private boats are plentiful, ranging from Q10 a person for the public boat ($1.25 USD) to Q100 for a private boat ($12.50 USD). We have the perfect place to call home while exploring the rest of the lake. We have a beautiful home we wish to share with you, great for families, special occasions and parties. We are flexible so send us a message if you have any questions or concerns.